Did a season-ending slide affect the Syracuse Orange's seed? HomeBasketballDid a season-ending slide affect Syracuse’s seed? Syracuse faltered down the stretch but still earned an 8-seed. 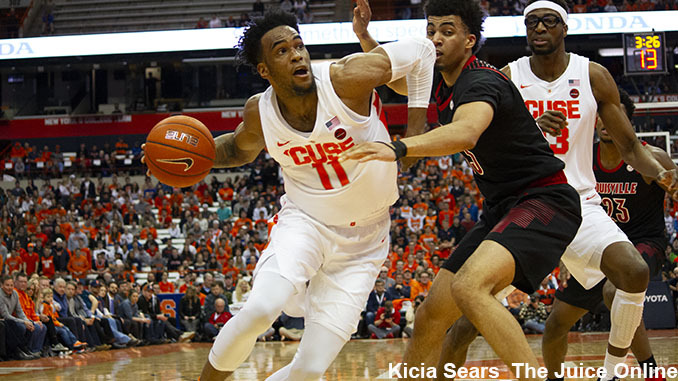 Oshae Brissett drives against Louisville. Mandatory Photo Credit: Kicia Sears, The Juice Online. As teams jockey for quality wins and seeding in the NCAA Tournament, the last thing any coach wants is to close the year on a season-ending slide. Since joining the ACC, that’s something Syracuse has had a difficult time avoiding. Sure, teams can turn it on in March and make a deep tournament run. The right draw, a vulnerable seed, and a hot-shooting night are all key ingredients in an upset. Survive and advance! The favorites to cut down the nets are typically playing their best basketball as the regular season closes. That’s one reason why they earn high seeds and favorable draws. But isn’t the opposite also true? Can stumbling across the finish line cost a team a seed or two, or, ship them to a more challenging region? Syracuse had a brutal slate to close out the year. The Orange lost four of five games including back-to-back games against Duke and at North Carolina. And Virginia rained on Syracuse’s Senior Night by draining 18-of-25 three-point shots. The Orange slightly rebounded in the ACC Tournament by beating Pitt and mounting a furious comeback against Coach K’s bunch to turn a blowout into a tightly-contested game before succumbing to the Duke Zion Devils. Similar to this season, Syracuse’s final five regular season games last year included back-to-backers with Duke and Carolina. They lost both games and finished with four losses in their final six games. And also just like this year, they split two ACC Tournament games. The loss being a 19-point blowout at the hands of Carolina. They earned an 11-seed, and a spot in the First Four, in the NCAA Tournament. The Orange went on a bit of a run by advancing to the Sweet 16 after beating 3-seed Michigan State in Detroit. Syracuse began its season-ending swoon with seven games to go. The Orange lost five of those highlighted by three consecutive defeats to Pitt, Louisville, and Georgia Tech. Syracuse finished with an ACC Tournament loss to Miami. The Orange missed the NCAA Tournament and lost at home to Ole Miss in the NIT. Adding insult to injury, Mike Hopkins departed for the head coaching job at Washington once the season was over. Syracuse would ramp it up in the post season making an unexpected run to the Final Four as a 10-seed. Before discovering some March magic, the Orange lost four of its last five regular season games – three of them coming on the road. They followed that up with an ACC Tournament loss to Pitt. With Syracuse on a self-imposed post season ban, the Orange dropped four of its last five games; three of which were on the road. After a win at Notre Dame, Syracuse finished with three consecutive losses highlighted by a 19-point thumping at Duke and a 12-point home loss to Virginia in which the Cavs held them to 47 points. Syracuse’s first season in the ACC began with a 25-game win streak that game to an abrupt end with an overtime home loss to Boston College. The Orange then closed the regular season with three losses in five games; four of which were on the road. You might remember the loss to Duke in that stretch; the infamous Jim Boeheim Jacket Game. Syracuse also lost its only ACC Tournament game to NC State. Despite the season-ending slide, Syracuse still managed to snag a 3-seed in the NCAA Tournament. Though, the Orange was upset by 11-seed Dayton in the Round of 32. Cast as an 8-seed, the Orange heads to the West region for a date with 9-seed Baylor on Thursday in Salt Lake City. Syracuse certainly has the talent to repeat its Sweet 16 run of last year. But did its all-too-familiar season-ending slide make its quest that much tougher? We’ll soon find out.